10 years previously Rita, 50, began to have problems off and on with the use of her hands and had breathing problems. Nothing abnormal was diagnosed. Since January 2007 she had had ongoing problems with various neurological symptoms including lack of coordination, tingling, general weakness, pain and numbness. She used sticks to walk and had a mobility scooter and a disability badge. She had been in and out of hospital for tests and recently had been in hospital unable to walk at all for a month, yet apart from a possible diagnosis of Multiple Sclerosis she had not had a definitive diagnosis. Rita had known about this work for a few months but initially she was not open to the fact that her symptoms could be emotionally induced. After a course organised by work she began to accept that this might be the case and booked an assessment with Georgie. During this assessment Rita disclosed a number of very traumatic experiences during her life, including the traumatic death of her husband and one of her daughter’s and she told Georgie that she felt “the shelf on my shoulder where I stuff all my problems is crumbling”.She recognised that she had been emotionally very strong and ‘coped’ with everything in her life by bottling everthing up and just getting on. She also began to see how her symptoms had become the escape valve for all the internal emotional turmoil that had been building up. Within 10 days of starting the SIRPA programme and after beginning to journal, she was 90% better and was walking normally with no walking aids and excellent balance and coordination. For Rita, journaling was an invaluable way for her to offload how she felt about things and then gain perspective so she could move on with her life. 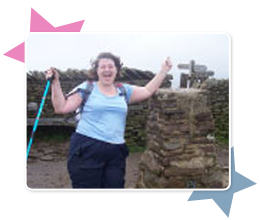 Within 8 weeks Rita climbed Pen Y Ghent in Yorkshire with Georgie without any problems.